As the voice of cycling has grown louder, Jenny Jones has become a well-known name in the campaign for cycling in London. Regularly speaking up for cyclists at the London Assembly, her 12 years working for the Green Party at the Greater London Authority have given her a unique insight into the workings of the fiefdom of the mayor of London. This year sees her line up as the Green candidate for that very position against the respective red and blue juggernauts of Ken Livingstone and Boris Johnson. CW: Has anybody been a particularly inspirational figure for you? JJ: Somebody that I did look up to died last week, actually. She was a lifelong communist, CND member and so on. Eileen Daffern was her name. It would be easy to talk about very high profile people, but actually I also look up to people like my parents who had really strong social consciences and taught me that you shouldn’t really let people drop litter in the streets. Why is cycling an issue that you feel so strongly about? JJ: For me it’s a great way to get around; it’s fast, it’s efficient, it’s healthy, and it’s just a normal part of life. It fits perfectly with a ‘Green’ way of looking at things. 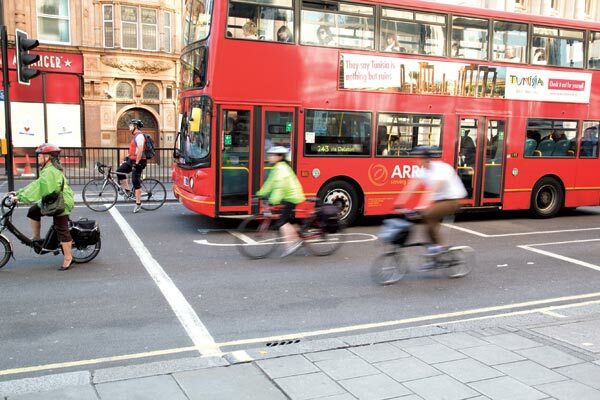 If you want to clean up air quality, make space on the buses and the tube, or if you want a healthier population, then cycling’s a great thing to do. I walk a lot as well and I think that there hasn’t been enough consideration for cyclists and walkers for the past 50 years, but we’re getting there in London. Why do you think the current support for cycling in London is as high as it is? JJ: I’ve been talking about cycling since I got here in 2000, and back then I used to get laughed at as if I’d talked about something completely inconsequential and irrelevant. In a sense, cycling at one per cent of modal share in London is fairly inconsequential, but if you want to expand it to 10 per cent as many of us do, or even beyond if that’s possible, it has to have a political voice and there have to be a few negative headlines as well, that kind of thing is absolutely inevitable. I think the LCC [London Cycling Campaign] has done a huge amount for this because it has created a voice for cyclists. The real shame is that there’s no voice for pedestrians in the same way. What I always hope is that cyclists, when they’re looking at junctions and thinking about how they should use the roads, should always make sure and consider pedestrians as well. Is there a ‘cycling vote’? JJ: Oh for sure, we’re seeing it now in City Hall where Labour and the Lib Dems are now very supportive of the cycling agenda. I’m thrilled about that because as a Green politician I realise that I can’t push things through on my own. It’s really important that the other political parties take up cycling. There’s a big vote out there and it’s right that politicians should try to satisfy that voice. What do you think of the LCC’s Go Dutch campaign? JJ: I think it’s really good. I was in Holland late last year and it was a bit of a revelation because although I’ve been before, I’d never been to look specifically at cycling. All the infrastructure is there, which helps, but also it’s the mentality where people just assume that cycling is a sensible way to get around. My partner pointed out that one of the really nice things about it was that you could hear cyclists coming because you could hear them talking to one another. Do you think that cycling’s voice will ever be louder than it is at the moment? JJ: Who knows what the future holds, but as long as it can stay very loud up until May 3 this year then I think they could bring in changes that would increase the cycling voice and the number of cyclists. The last four years have been a wasted opportunity in terms of cycling, because although we’ve had these two big schemes that I’ve supported, we’ve missed out on all the small-scale stuff that could have got people cycling. These things didn’t have to be expensive, but they haven’t happened because this mayor decided, even though he cycles, he is actually quite pro-car in his traffic modelling. His smoothing traffic flow agenda has been disastrous. He’s taken crossings out which means it’s less convenient for pedestrians and cyclists too. He’s speeded up motor traffic – that’s got to be bad for cyclists. Quite frankly, the less safe you make cycling, the fewer people are going to take it up as newbies. Women in particular are very concerned about their safety, perhaps being less macho, so fewer women are cycling which I think is a disaster. As a woman cyclist, have you considered cycling less? JJ: In fact I had two crashes. It has meant I cycle less. I cycle a bit less often to work because on both occasions I was on my way to work when I got knocked off and I think there are mental connotations for me now. I tend now to make sure I cycle before there is a lot of traffic. That’s why I want more people to cycle – so it’s safer for me to get to work! It’s very selfish! What would you like to change to make cycling safer and more pleasant? JJ: If I had one wish, I would bring in a London-wide 20mph speed limit. You could have a few roads that you’d opt out, but by and large, it would be 20mph so that anybody doing over 20mph is almost sure that they’re breaking the speed limit. I did a report recently on 20mph for the transport committee here, and at the time there were eight boroughs that wanted to go with borough-wide 20mph limits and I tried to get some money for them from Boris and he absolutely wouldn’t give them any. I’m sorry if I sound a bit bitter about this, but I’m annoyed at him. When he got elected he said he’d let the boroughs do what they wanted. This doesn’t appear to be the case. How much difference would a 20mph speed limit make? JJ: Slowing the traffic down would make a big difference, and after that you can do loads of things. It wouldn’t be a very expensive move because once you’ve told everybody you can take down a lot of street signs and declutter our streets. Does being pro-cycling mean that you are anti-car? JJ: Maybe three times a year I might end up driving a car myself so I’m not against the car because I can see the value of it. But I’m against using the car as a thoughtless act because there are repercussions. It’s not just the cost, which is becoming considerable with fuel price rises, but it’s also about polluting the air, the crashes, the injuries and deaths we have on the roads which cost us millions and millions every year. I think the DfT priced a road death at £1.4 million because of all the emergency services and police investigation and hospital time and then social benefits and so on. People just nipping out in their car to the nearest shops, we’ve got to try to make them think differently and to perhaps just walk or cycle. I’m not anti-car, but anti-thoughtless-use-of-cars. What are your thoughts on the Bikes Alive protest? JJ: I love non-violent direct action. But I have qualms about the Bikes Alive approach because I think its potentially a bit aggressive. As I ask the police to be relentlessly polite with their stop and searches, we as cyclists should also be relentlessly polite. I know that’s really hard and I’ve shouted myself at bus, taxi and car drivers, but it doesn’t pay to be immediately aggressive. I like critical mass as well, but we have the problem of anger against us. The feeling of safety you get when you’re one of several hundred cyclists is unforgettable. Are you happy with the plans for Bow Roundabout? JJ: If LCC says they’re OK as an interim measure, then I will happily go along with it. But there isn’t enough pedestrian access so as far as I’m concerned, we need a promise from TfL that we’re going to do something about it later in the year. and we may not have had two deaths and all this fuss now. Do their plans offer some hope for the rest of London? JJ: I think this is TfL running scared of the fuss that has been created and if there isn’t the same fuss about every piece of appalling transport infrastructure then I don’t think so. While you have a mayor who talks about smoothing traffic flow you can’t expect changes from TfL because that’s not what they’re told to do. I think we need a different mayor… even if it’s Ken! Because he didn’t cycle and had no interest in cycling himself, he was quite happy to take advice from other people. Boris thinks he knows everything there is to know about cycling, but of course he’s not the average cyclist. He experiences no fear himself, and so he cannot understand what its like to be constantly frightened of heavy lorries and big buses.